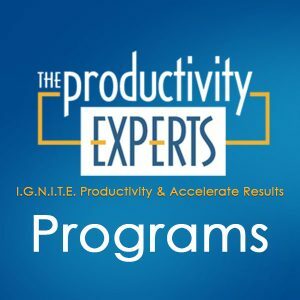 The Peak Performer Program is designed for people who want to dramatically increase their productivity. It helps them to get the support they need to develop the habit of using their new productivity tools — tools designed specifically to fit their natural style. Simple, effective tools – designed to fit your natural style to dramatically boost your productivity. I want you to make an informed decision. To that end, I want to make sure you are aware of what you’re foregoing by choosing the Peak Performer Program instead of the Life-Time Peak Performer Program. In essence, the Peak Performer Program will boost your productivity in the environment in which you work today. It does not provide the ongoing support that will allow you to adapt quickly and productively to new opportunities, establish and achieve new goals, avoid new energy drains or keep you from falling back into old habits during times of stress. The ongoing coaching support of the Life-time Peak Performer Program is what truly makes results sustainable year after year in the dynamic environment in which you live.